Book 2 in the LuxSci Internet Security Series. 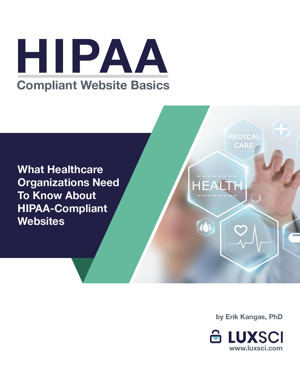 This LuxSci eBook is your well-researched guide to both a critical understanding of the specific issues and concepts of HIPAA as it applies to web sites, so that you stay compliant with these government standards. This document will provide a framework for your health care organization to keep the privacy of patient information front and center while still having an engaging web presence. Providers will have the necessary tools to meet all requirements established by HIPAA for access to, storage of, and transmission of protected health information (PHI) through web sites. What are HIPAA-compliant web sites? What is HIPAA-compliant web site hosting? What are HIPAA-compliant web forms?